Foxford is the place to be on Friday, August 18th as the Riverfest kicks off by the banks of the Moy and continues with a schedule of exciting events lasting the weekend. The festival is one of a number of events in Mayo supported by Creative Ireland, an initiative which aims to get people more involved in arts, culture and creativity. ”Creative Teams have been appointed in every county nationwide, to help drive culture and creativity nationwide,” said the Minister for Culture, Heritage and the Gaeltacht, Heather Humphreys, TD. “Through Creative Ireland we don’t just want to improve access to arts and culture; we want to see more people getting involved”. 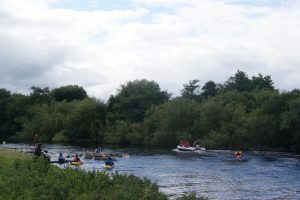 Foxford Riverfest, which is a celebration of the famous river and its beautiful surrounding countryside, has events to cater for all ages. And there are new events added to the schedule since a highly-successful festival in 2016. The event will be opened on Friday night by renowned RTÉ broadcaster Keelin Shanley, before the Moy will be lit up with a special ‘Candles to the Sea’ event. The fabulous Foxford Brass Band will bring life to the area with their own unique style. It will be ‘all systems go’ on Saturday with a wide range of events occurring right throughout the day. Midwest Radio will be broadcasting from the town from morning right up until 5 p.m. Among the main events on Saturday will be wildflower and historical walks, boat building, a rowing competition and a kayaking demonstration. Q&A session at 6 p.m. on Saturday evening while more music entertainment will be provided well into the night. The Riverfest stage will present an eclectic line-up of local and other well-known artists, delivering a wide variety of genres ranging from jazz to trad. Ain’t Misbehavin’ will all be on hand to bring some atmosphere to Foxford. Exciting young local band Nerves also bring their own flavour of music to proceedings. DJ Relish will be the highlight act on Saturday night before another jam-packed day on Sunday. A salmon fishing competition will be an all-day attraction on Sunday with other events running concurrently. Those events will include wool-spinning demonstrations, pottery demonstrations as well as a host of activities to keep children entertained. There will be an awards presentation at 6 p.m. on Sunday evening immediately after a boat race along the river. The curtain will finally come down on the festivities with a spectacular fireworks display above the town on Sunday night. The Creative Ireland strategy is set to last five years – starting from this year – and, if successful, it hopes to boost well-being in schools, homes and communities nationwide. For information about this year’s event in Foxford visit www.foxfordriverfest.com. And for further information relating to Creative Ireland and its objectives, visit creative.ireland.ie.